Addition of N6-monobutyryl cyclic AMP (BtcAMP) or methylisobutylxanthine to embryonic chick pelvic cartilages incubated in a serum-free medium for 3 days stimulates the cartilages to grow predominately through increasing cellular hyperplasia . The present study investigated whether parathyroid hormone (PTH) added to the serum-free organ culture system would mimic the growth-promoting effects of BtcAMP through increasing endogenous cartilage cyclic AMP content. Parathyroid hormone 10 nM stimulatesin vitro pelvic cartilage growth as compared with cartilage grown in medium alone, as estimated by increases in wet weight (64%), dry weight (91%), total soluble protein (19%), and deoxyribo-nucleic acid (DNA) content (51%). Parathyroid hormone (0.1–10nM) in a concentration-dependent manner produces increases in wet weight and radiolabeled precursor incorporation of [3H]thymidine and [14C]-L-leucine over cartilage incubated in medium alone. 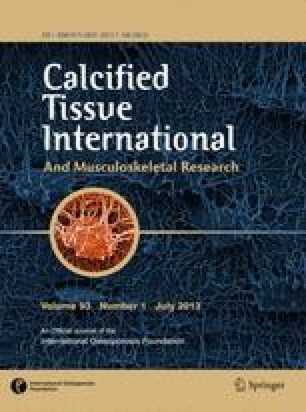 Both PTH-treated and BtcAMP-treated cartilage show histological changes of increased cellularity as well as raised DNA content and elevated DNA/protein ratios. PTH increases cartilage cyclic AMP content, with the maximum rise occurring after 30 min incubation, and a return to levels found in pelvic cartilages incubated in medium alone by 4 hours. Consequently, cartilages incubated in medium containing PTH for 4 hours and then incubated in medium alone for the remaining 3 days, grew as well as cartilages that had been incubated in medium containing PTH for the entire 72-hour period. Thus, PTH, by raising intracellular cyclic AMP, triggers cartilage growthin vitro.